The treadmill is great for a cardio workout, but it doesn't do anything or your upper body. Dumbbells are a good choice for upper body strength exercises. How can you put them together for a challenging workout? One way is to turn your treadmill time into a circuit workout using dumbbells for upper body exercises. 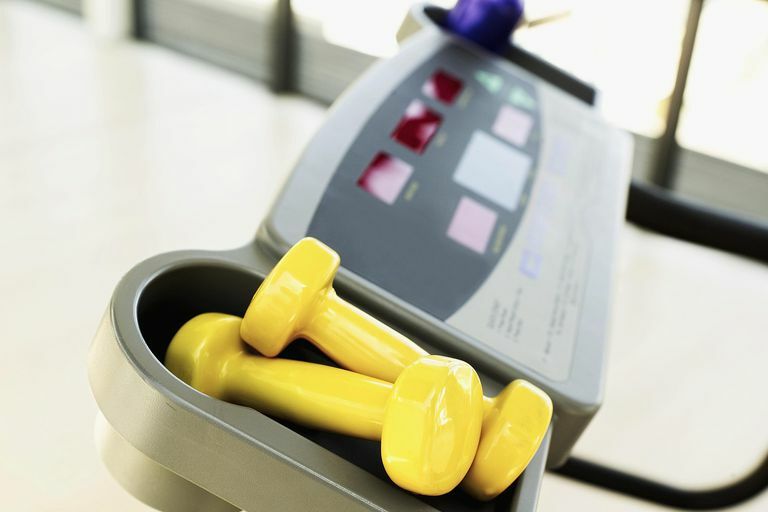 To get ready, set a pair of 5- to 12-pound dumbbells (depending on your strength and experience) near your treadmill. Equipment: Select a pair of dumbbells depending on your strength, from 5-pound to 12-pound size. Place them on the floor near the treadmill in a spot where you'll be able to do the upper body exercises. You may want to position yourself in front of a mirror so you can check your form. Treadmill Warm Up: Warm up on the machine with a five-minute brisk walk. Use good walking posture and form, and do not hold onto the handrails. Bend your arms 90 degrees and swing them back and forth in opposition to your stride as you should be doing for brisk walking. This will warm-up your arm and shoulder muscles and joints for the upper body exercises. Jog or Walk Fast for One Minute: At the five-minute mark, set the speed higher at a pace where you can run or walk very fast for one minute, such as 6 mph. Pause the Treadmill and Get Off: After the one-minute jog, slow the treadmill and pause it if it has that function to safely get off the treadmill. Dumbbell Exercises: Position yourself in a good stance for doing upper body exercises with the dumbbells. If you have an upper body workout you like, do one set, taking about one to two minutes. Here are some moves: dumbbell bicep arm curl, dumbbell overhead press (shoulders and triceps), dumbbell triceps extension, dumbbell front raises (shoulders and chest), and dumbbell lateral raises. Get Back on the Treadmill: Back onto the treadmill for one minute or more. For an extra challenge, you can boost the speed. However, you don't want to exceed an exertion level where you can't perform the dumbbell exercises with good form. Your heart rate should be elevated, but good form is important both on the treadmill and with the dumbbells. After a Minute: Now do the next dumbbell exercise you've chosen, without a rest. Pay attention to using good form. If you are too out of breath do to it correctly, back off on the treadmill speed. Back on the Treadmill: Repeat this sequence until you have done all of the exercises. If you have enough time, you can repeat the upper body exercises for several sets. Spend 20 Minutes Alternating Treadmill-Dumbbells: See if you can do this switching back and forth between dumbbells and treadmill for 20 minutes nonstop. Cool Down: On your final treadmill interval, lower incline to zero, and cool off with a moderate walk for five minutes. For variation, your intervals on the treadmill can be longer than a minute. You can also do more than one type of upper body exercise during each interval but in that case, your heart rate might not remain as high. It's best to do just one type of dumbbell exercise each interval. As a general rule, it's best not to carry weights in your hands when you walk or run. The hands are an unnatural place to have extra weight and it can increase strain on your neck, shoulder, elbow, and wrist. It's better to use the dumbbells when you are stationary for upper body work. If you want to add weight to your body for cardio exercise, that is best done with a weight vest. That would allow you to use proper walking and running arm motion, which is more difficult when carrying weights in your hands.